MARBLE FALLS — While the 2018 Camp Agape camp is one for the history books, officials are already planning next year’s, and you can help by lacing up your sneakers Aug. 25 for the annual 5K memorial run/walk. Camp Agape is a bereavement camp for ages 7-12. The 2019 camp is scheduled for July 8-11 at Camp Buckner Retreat Center in Hoover’s Valley. It is for children who have lost someone close to them — a family member or friend — and helps them through the grieving process. The 5K memorial run raises funds so kids can attend the camp at no cost to their families. 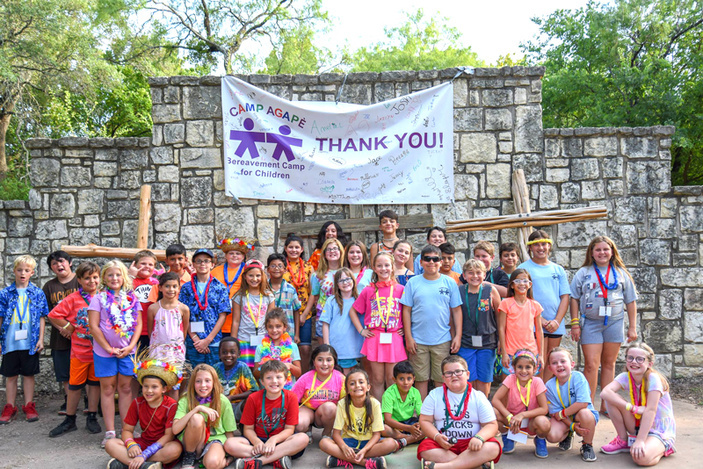 Along with learning skills and techniques that will help them through the bereavement process, both during camp and after, Camp Agape also includes fun and exciting summer camp activities. Campers see they aren’t alone in their grief as they meet other kids going through similar situations. Kids are each assigned an adult Buddy during the week. That volunteer becomes a shoulder on which to lean, a listening ear, and someone with whom to share a laugh as the child lands their first fish or the biggest belly flop in the pool. Group therapy activities incorporate art and music to help lead the child through the grief process. On Saturday, Aug. 25, the run/walk begins at 8 a.m. in Johnson Park, 230 Avenue J in Marble Falls. Sign-in is at 7 a.m. The event includes a kids walk and 1K and 5K courses. Pre-registration is $25 for ages 13 and older and $10 for ages 12 and younger. On race day, registration goes up $5. There will be a balloon ceremony on completion of the run/walk to honor departed loved ones. Participants will include former campers as well as family members and friends of those being remembered. All run/walk participants will receive a T-shirt. Medals will be awarded to the top three finishers in the men’s, women’s, and youth categories. The team with the largest number of participants will receive a trophy. But you don’t need to be a member of a team to register.